The decline, according to the Periodic Labour Force Survey (PLFS) 2017-2018 report by NSSO which the government has withheld, is more acute in the working age group of 15-59 years. 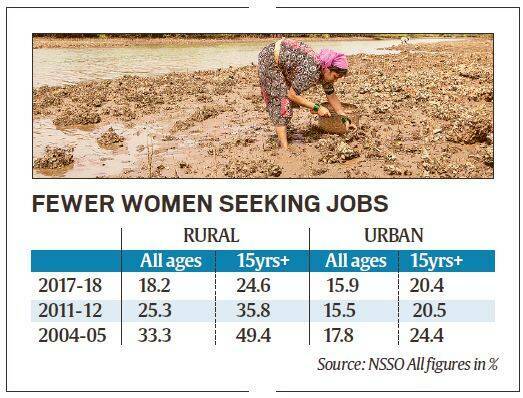 Over five crore rural women have left the national job market since 2004-05. Female participation has fallen by 7 percentage points since 2011-12, amounting to approximately 2.8 crore fewer women looking for jobs. The decline, according to the Periodic Labour Force Survey (PLFS) 2017-2018 report by NSSO which the government has withheld, is more acute in the working age group of 15-59 years. 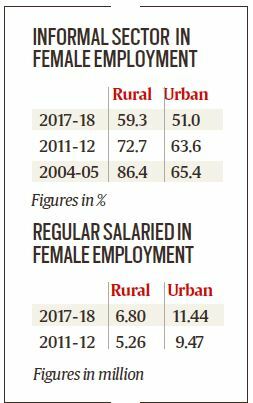 In this bracket, the rural female participation rate fell from 49.4 per cent in 2004-05 to 35.8 per cent in 2011-12 and further to 24.6 per cent in 2017-18. In effect, participation of rural women of working age has been halved since 2004-05 (see chart). “Higher participation in education is one answer to the puzzle but that cannot explain such a massive drop. One explanation is that fewer women are likely to remain in a shrinking job market where men have the upper hand. Part of it could also be the result of a cultural shift that makes the once-independent village woman a victim of growing social taboos against going out and working,” said an expert who did not want to be named. In the urban segment, though, female participation increased by 0.4 percentage points in the six years ending 2017-18, amounting to 12 lakh more job seekers. This bucks the trend as female participation in urban job market had fallen by 2.2 percentage points between 2004-5 and 2011-12. Also, the share of regular wage/salaried jobs for women, the PLFS 2017-18 shows, registered a rise since 2011-12. In the urban sector, the jump is by 9.6 percentage points and, in actual terms, accounts for an additional 20 lakh jobs. In the rural sector, the segment’s share increased by 4.9% percentage points and it translated into 15 lakh more jobs. Among urban female workers, the share of non-agricultural informal sector – unincorporated proprietary and partnership enterprises in areas such as manufacturing garments, paper, wood and straw products etc – dropped sharply by 13.6 percentage points. “Many small enterprises could not recover from the effects of a series of induced economic disruptions. Many others had to downsize to survive. When it comes to cost cutting, unfortunately, the women workers are often considered more dispensable,” said another expert in condition of anonymity. The share of non-agricultural informal sector has also slipped by 13.4 percentage point among rural female workers but that has been the trend since 2004-05 (see table-2). For the urban female workers, the slide is sharp.